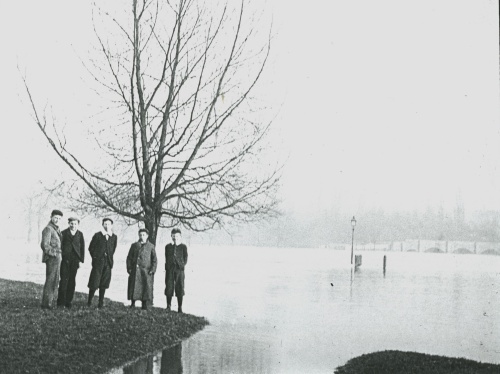 The Quorn to Barrow Slabs footpath under water in the 1920s. 'Scotche Greene' or the 'Auncient Meere' is the old name for the meadow which the slabs footpath crosses. Meere being the old word for boundary. The parish boundary would have originally run from the Priest Bridge (by Quorn Hall lodge) across the Slabs meadow to the river. There are still traces of a ditch. "It is well known that til 1886 the path ran from Barrow Bridge along the river for about 250 yards and then bent to the right and so across the avenue, but it had been forgotten that formerly it followed the river bank all the way to Quorn village, even going between the Hall and the river". The path was diverted to the other side of the hall in 1788, when Quorn Hall was occupied by Hugo Meynell. The name "slabs" came from the time when Sir Richard Sutton was Master of Foxhounds (1847-1855). He maintained a private railroad siding at Barrow, where hounds and horses were loaded for transport to distant meets. He built himself a quarter mile long flagstone walk through the middle of the meadow to keep his boots dry while he walked to the train. The path at that time was paved with rough slate slabs.